It’s been an action packed month at PBSA! A Peerplays hardfork took place earlier this week and our plans for 2019 became a little bit clearer in more ways than one. and the PPY token was listed on a couple new exchanges! Our last update contained a handful of milestones to watch out for over the coming weeks and months, and we’re happy to say we’ve seen great progress. Getting BookiePro live requires the hard work and cooperation between Peerplays Witnesses and PBSA. However, once code gets into the hands of Witnesses, implementation is fully in their capable hands. The first milestone achieved was deploying the Peerplays blockchain code upgrade (aka the hardfork of Peerplays mainnet), which was completed in mid-February. More recently, Witnesses were provided the code to install the latest BOS (Bookie Oracle Software) version on new mainnet nodes, which marks one of the final steps in preparing BookiePro for livenet launch. This remains an important work in progress. What happens now is a series of ongoing testing to ensure everything works the way it’s supposed to. With Witnesses being such an integral part of the BookiePro mainnet launch, we remind everyone that it’s impossible for PBSA to give an exact launch date. What we can say is that it will be soon! Lastly, when BookiePro does launch, look for a play token to start. The token used will be familiar to anyone who followed the BookiePro.fun beta phase: BitFun! Introduction of Bitcoin sidechain to Peerplays is the fourth PIP (Peerplays Improvement Proposal) added to the peerplays-network community repo on Github. The PIP also includes a link to the latest sidechain code. View the entire thing here. We’ve secured an all new way to get Peerplays updates! Many of you probably know about Blockfolio already. If you don’t, it’s an app that tracks cryptocurrency portfolios to give you a real time estimate of your holdings. Millions of people use it to regularly track their crypto investments, including PPY. Blockfolio Signal Beta allows organizations to push notifications to their followers! For instance, PBSA could - and just may! - push a message about this very newsletter dropping, and everyone who follows PPY in Blockfolio will be notified. It’s a very handy tool that hundreds of other tokens and coins are using to their advantage. Using Blockfolio Signal will allow PBSA to interact with PPY holders and followers who may not already follow us on Twitter or Telegram. You can download Blockfolio here. 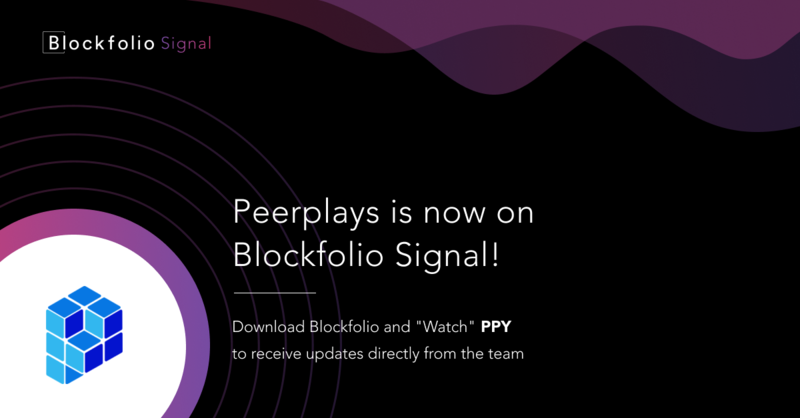 Over the past month, PPY has been added to two new cryptocurrency exchanges, making it easier than ever to buy and sell the Peerplays core token. The new exchanges are IDAX and Exrates. IDAX consistently ranks among the top 15 exchanges by traded volume, according to CoinMarketCap, and has been designed for ease of use. Exrates, a newer and actively growing platform, usually places in the top 40 exchanges globally. To read our full press release on the new exchanges, click here. In one more piece of exchange news it appears that, as of this writing, LiveCoin trading is back up and running. If you weren’t aware, they had been undertaking a big upgrade on their end, which put a halt to PPY trading for a longer period than anticipated. Who Is Influencing the Conversation on Blockchain? The rapid pace of innovation in the blockchain space makes keeping up with the conversation next to impossible. To help us make sense of it all, we did a deep dive on Twitter to unearth the most influential names in the Blockchain space, and who is making noise. Read all about our findings here. Copyright © 2019 Bunkerchain Labs Inc., All rights reserved.